What is CA 125 test? What is a tumor marker? What is the normal range for CA 125? What does a high CA 125 level indicate, and how is the CA 125 test used? What conditions other than ovarian cancer can cause increased CA 125 results? Is CA 125 testing useful as an ovarian cancer screening test? Does insurance cover CA 125 testing? CA 125 is usually measured from a venous blood sample. It can also be measured in fluid from the chest or abdominal cavity. It is not possible to interpret the meaning of abnormally high CA 125 results without additional information about the particular patient being evaluated. The reason is that blood levels of this protein can be increased in many different benign and malignant conditions, and an elevated level does not mean that ovarian cancer or any specific condition is present. CA 125 is used most often to monitor patients with a known cancer (malignancy) or as one of several tests in the workup of a patient suspected of having a tumor. The most common use of the test is the monitoring of people with a known cancer that elevates CA 125 level, such as ovarian cancer. Serum CA 125 values are elevated in approximately 50% of women with early-stage cancer and in over 80% of women with advanced ovarian cancer. In the patient who is known to have a malignancy, such as ovarian cancer, the CA 125 level can be monitored periodically. A decreasing level generally indicates that therapy, including chemotherapy, has been effective, while an increasing level indicates tumor recurrence. Because of normal test variation, small changes are usually not considered significant. A doubling or halving of the previous value would be important. In the patient who is being evaluated for a pelvic mass, a CA 125 level greater than 65 is associated with malignancy in approximately 90% of cases. However, without an obvious pelvic mass, this association is much weaker. CA 125 levels are high in about 1% of healthy women and are not always a sign of ovarian cancer. Further, a number of benign conditions can cause elevations of the CA 125 level, including pregnancy, endometriosis, uterine fibroids (benign tumors), pancreatitis, normal menstruation, pelvic inflammatory disease, and cirrhosis of the liver. 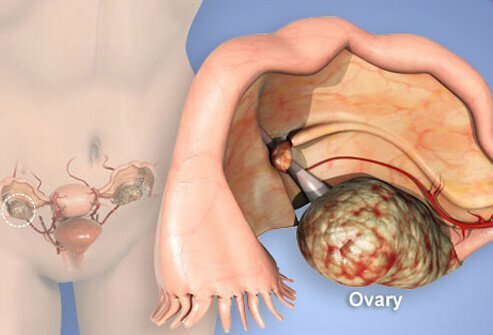 Benign tumors or cysts of the ovaries can also cause an abnormal test result. Increases can also be seen in cancers other than ovarian cancer, including malignancies of the uterine tubes, endometrium, lung, breast, pancreas, and gastrointestinal tract as well as lymphoma. Although CA 125 is a useful test in monitoring women who are being treated for ovarian cancer, a single CA 125 test is not considered to be a useful screening test for cancer. Some women with ovarian cancer (up to 20%) never have elevated CA 125 levels, while most women who do have elevated CA 125 levels do not have cancer. In fact, because the results of CA 125 testing can be elevated in so many noncancerous conditions (sometimes called false-positive results), only about 3% of women with elevated CA 125 levels have ovarian cancer. As with any test, insurance coverage depends upon many factors, including the reasons the test is being ordered and the patient's medical history. Typically, insurance covers the test when a medical professional orders it for monitoring ovarian cancer and may be covered for additional settings. It is important to ask your physician and contact your insurance company with any questions you may have about coverage. King, G.G.T. "CA 125." Medscape.com. Oct. 30, 2015. <http://emedicine.medscape.com/article/2087557-overview>. What was the outcome of your CA 125 blood test? Share your experience with your CA 125 test results. Please describe what caused your elevated CA 125 test results. Front View of the Pancreas. The pancreas is about 6 inches long and sits across the back of the abdomen, behind the stomach. See a picture of the Pancreas and learn more about the health topic.